In Europe, black cohosh is used to relieve menopausal symptoms such as hot flashes, headaches, psychological difficulties, and associated weight gain. It is also reputed to be helpful for premenstrual problems and painful menstrual cramps. 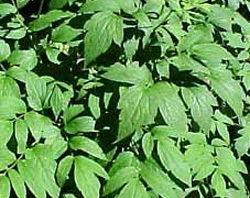 Native Americans prized black cohosh and used it for a variety of purposes. The settlers learned about it from the Indians, but by the middle of the nineteenth century it was renowned as being helpful for women’s problems, and other uses were more or less forgotten. Menopause can be very disruptive in the lives of women who experience hot flashes, mood swings, and other symptoms. Hormone therapy scares have led many women to seek alternative treatments for menopausal symptoms such as osteoporosis and postmenopausal cardiovascular disease. Soy – Scientific tests show that bone density is increased and depression, irritability and hot flashes are lessened. Although soy can decrease some symptoms associated with menopause, large amounts must be ingested for it to be completely effective. Natural Progesterone – Extracted from plant sources, “natural” progesterone has been widely used to treat menopausal symptoms, but no scientific evidence exists to prove its effectiveness. Fish Oils – Rich in Omega-3 fatty acids, fish oil can be a positive component in preventing cardiovascular disease in menopausal women. You can get it through the consumption of fish or via a fish oil capsule if it’s more convenient. Magnesium – Studies have found that the use of magnesium significantly increases bone mineral density in both the elderly and menopausal women.